His very name hovered on the line between slavery and freedom: Orindatus Simon Bolivar Wall. Orindatus was a slave's name, through and through. It had a Latinate grandiosity that many masters favored for their chattel when Wall was born on a North Carolina plantation in the 1820s, the son of his owner and a slave woman. All his life, people got the name wrong. They called him Oliver. They called him Odatis. Eventually, he went by his initials: O.S.B. Wall. As much as Orindatus signaled slavery, his middle names suggested the opposite: Simon Bolivar, the great liberator of Latin America, a man who had decreed freedom for slaves and led a popular movement he described as "closer to a blend of Africa and America than an emanation from Europe." Perhaps this was Wall's father's attempt at irony, an ultimate affirmation of his mastery. But perhaps the name represented other ideas and aspirations that Stephen Wall harbored for his son. In 1838, he freed O.S.B. Wall and sent him to southern Ohio, to be raised and educated by Quaker abolitionists. His mother stayed behind. By any measure, O.S.B. Wall soon became a hero of African-American history, the kind of man Black History Month was created to celebrate. But today he is forgotten. The story of his rise to prominence and fall into obscurity reveals one of the great hidden narratives of the American experience. While O.S.B. Wall spent a lifetime fighting for civil rights, his children grew up to become white people. Over the half-century that followed his emancipation, O.S.B. Wall stayed in constant motion. He learned the humble art of bootmaking, a trade long associated with radical politics—many of the people who kicked down the Bastille's doors had stitched their own shoes. Wall put his radicalism to work in the 1850s when he moved to Oberlin, the most abolitionist town in America. He became active in anti-slavery circles and a fixture of a black community that was prosperous and powerful. The township clerk was Wall's brother-in-law, John Mercer Langston, the first African-American elected to political office in the United States. In 1858, Wall was indicted under the Fugitive Slave Act for helping a vigilante mob rescue a man from Kentucky slave catchers. (Asked in federal court if he "knew the colors by which people of color were classified," he answered bluntly: "There were black, blacker, blackest.") During the Civil War, the Massachusetts Fifty-Fourth and other black regiments were filled with hundreds of soldiers that Wall recruited for the fight. 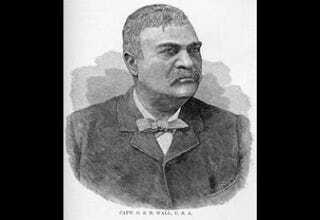 In 1865, he became the first African-American to be regularly commissioned a captain in the Union Army. Arriving in South Carolina just before Lee's surrender, he joined the Freedmen's Bureau and helped shape the end of slavery and the dawn of a new era. Read more of this article at Slate.